Having a clear and detailed social media strategy is vital for social mediasuccesss. Before you begin with your social media and social media marketing efforts, you want to make sure you have a map that guides you. Because that’s exactly what a social media strategy is: a map that tells you exactly where you should go, what route you should take to get there in the best possible way. And also what challenges you might face on the way. It’s often spoken about the importance of the social media strategy, but why is it necessary? Can’t you just skip it and cut to the chase? That’s exactly what many marketers do. Unfortunately. A social media strategy seems like something abstract to people. When they get started with social media, they want to dig in right away and start working on their tactics. But your social media strategy is more important than you might think. The strategy works like a blueprint of how you will work, and what you need to complete the project, and with that, ultimately reach your end goals. This complete guide will give you everything you need to create an extremely detailed and powerful social media strategy, no matter if you’re a beginner or a pro. This lays the foundation to your strategy. It’s as simple as explaining what your business does in one or a few sentences. It should be so simple that even a small child can read and understand it. When you start using social media for marketing your business, you probably have goals you want to achieve. It is very unlikely that your goal is to “market my brand”, because first of all, it doesn’t tell us anything. And second of all, it’s too big of a goal. When you are setting goals, you want to make them SMART. I know the SMART principle is always brought up, but that’s because it is so relevant, and the key to setting great goals. Now, when reading all of this, it’s a lot to take in, right? How do you possibly set goals that follow all of these things? Luckily, I have good news for you! It’s not as difficult as you might think. Setting goals that follow these criteria can be done in an effortless way, but only if you divide them into larger chunks so they’re more approachable and understandable. First of all, setting goals such as “I want to market my brand” simply doesn’t cut it when you are creating a social media strategy. It’s just like saying “I want to grow my business”. When you set goals, you need to set goals that work as milestones and that are easily measured. You can’t measure the goal “grow my business”. Well, technically, making one sale means growing your business. But the bottom line is that goals that aren’t specific will never be achieved because the reality is that there is no real way to achieve them. 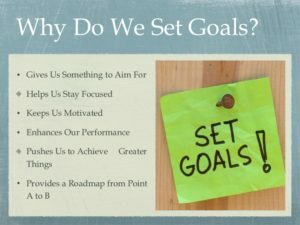 Second of all, you need to think about setting goals that are measurable. If you ask a marketer, they are all about asking the question “What’s the ROI?” on every marketing effort they make. But in order to measure ROI, you need to set goals that you can measure the ROI of. The fact of the matter is that social media has a lot of marketing power. But it also helps generate results on metrics that are extremely difficult to measure. One of the most common is brand awareness. Now, a lot of brands have brand awareness as a goal with their social media efforts – and that’s completely fine! The only problem is that brand awareness is highly tricky to measure, and therefore, it’s important that you’re aware of it before jumping into that goal. An advice I’d highly recommend you follow is to not set too many goals. When you set too many goals, you’ll just end up running all over the place and working a bit there and working a bit here. You’ll lose focus, and you’ll waste time. You’ll generate much better results if you focus on a few or even one goal. My recommendation is that you set one or two main goals and two or three secondary goals. This will allow you to create campaigns and invest your efforts in things that bring you closer to what you really want to achieve, rather than spreading your efforts everywhere. Sometimes, I see people asking the why of setting goals for your social media strategy. And really, there are three important reasons to think about. First off, setting goals will allow you to see if you are following your strategy. In social media marketing, it’s easy to get lost, and it’s easy to start taking detours by accident. When you have goals, you can see if the efforts you are investing in social media actually pay off, or if you need to rethink your efforts to better suit your goals. In other words, goals will let you regularly review your efforts and understand whether or not your efforts align with them. Secondly, by having goals, you will also have an easier time creating campaigns and doing things that will bring you closer to success. When creating campaigns on social media, you’re creating them with your goal in mind. if not, you’re doing it wrong. This means that when you create your campaign, you will choose the campaigns that are more suitable for your end goal. But if you haven’t set any goals, knowing what campaigns to work with is impossible. And thirdly, goals will also let you review whether or not your efforts are paying off. Social media demands a lot of effort and time. There’s no beating around the bush. As a brand, and especially as a marketer, you want to see if those investments of both money and time give any ROI. If you don’t have any goals, what will you measure? But if you have goals, knowing what to look for can be done effortlessly, and you’ll be able to quickly evaluate whether or not your invested resources pays off, and if they help you get you closer to where you want to be. If you’ve taken your business seriously, you’ve probably already defined your target audience in your business plan, but because your audience plays such a central role in your marketing efforts – not only on social media, it shouldn’t be left out. 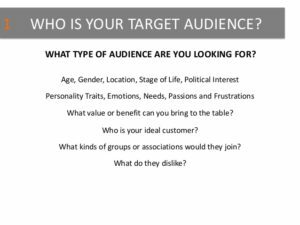 Your target audience is the group of people who are most likely to be interested in your brand and buy from you. Therefore, you obviously want to put the most effort into marketing to them. And more importantly: learning how you are going to market to them (more on that later). And this is a clear sign that they aren’t 100% aware of their target audience, and don’t dare to remove some people from the equation in the fear that they’ll lose customers. But the truth is that you’ll generate better results if you put all your focus towards the group of people who are most likely to buy from you and become customers, rather than aiming wide and trying to please everyone. A customer persona, also known as buyer persona, help you understand your customers better. This makes it easier for you to tailor your content, messaging, product development, and services to their specific needs, behaviors, and concerns. A customer persona essentially answers questions about your customers that will give you helpful information, and let you market to them better. When you have a clear customer persona, you’ll know everything about your audience, and you’ll be able to adapt your brand and social media efforts accordingly so that you are reaching them in a way that is resonating with them. 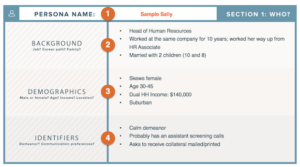 A customer persona can be extremely thorough and it can be extremely shallow. It’s of course up to you, but just know that the most detailed it is, the easier it will be to reach them, and reach them in a way that they find appealing. The most basic information is information such as gender, age, and job. More deep and important information is things like interests, pain points, passions, family, and what language they speak. This also brings us to the next point; choosing platforms. What platform you are going to use isn’t necessarily a part of your social media strategy, however, it plays an extremely important role in reaching your target audience and your customer persona. Because all social platforms are different. And when you’ve created your customer persona, you need to figure out what social platforms you are going to use, and this is dependant on one thing and one thing only: where your target audience spends their time! Therefore, you need to choose social platforms where your target audience spends most of their time, and are even to be found. You don’t want to start putting a ton of effort into a platform just to realize that the people you are targeting aren’t to be found there. Taking a look at the demographics of the social platform you plan to use will provide you with all the information you need to make a decision if it’s suitable or not. In fact, when you have developed your customer persona, you’ll be able to do it in a heartbeat. If your target audience is male, you can draw the conclusion that Pinterest isn’t a platform for you by looking at their user demographics. After all, 87% of their users are female. 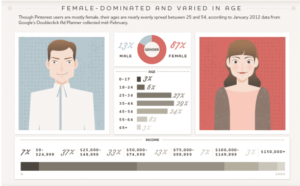 However, on the other hand, if your target audience is female, then Pinterest probably is a gold mine for your brand. All businesses have a personality. Whether you know it or not. The tricky thing is just to figure out yours. Your brand personality is usually mostly dependant on one thing, and that’s your audience. As a business, you want to reach your customers and potential customers. Right? So far so simple. But the thing is that all people who are customers of a particular brand fall into a specific category. They have something in common. For brands, it is important to know what that, or those things are because it will allow you to reach them better, and reach them with messages which they will find more appealing and interesting. When you have the starting point: your target audience, you’ve already come a long way. That is because you’ve already created a customer persona, and when you have, you know everything that is worth knowing about your audience. When you are meeting people, you’re probably adapting your language, personality, conversation topics’ and tone, based on the person or group you are talking to, right? Of course, you do! It’s a protection mechanism in us that makes sure we fit in and aren’t excluded from the group. After all, way back in the days, you wouldn’t survive without a group, so, therefore, it was vital. Today, a lot of things have changed, but the principle still remains. For brands, it is a deadly mistake to change personality all the time. And the reason to that is because your target audience always remains the same. If your target audience would shift all of a sudden, then obviously, you would need t change your personality in order to fit in, but otherwise, changing personality is something you should stay away from at all costs. Now that you’ve defined the people who are your target audience, you want to reach them with the help of social media. To become more approachable, you adapt your personality to the people you are trying to reach. Seems reasonable, right? You’re more likely to become friends with someone who is the same age and gender as you, and speaks the same language as you, right? 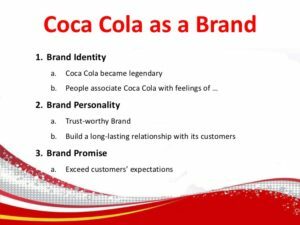 And that what makes a personality for a brand so important. It will allow you to reach your audience in a much better way. But before you can decide on a personality, you need to know what personality works the bests and that’s exactly what the audience identification does. Just look at Wendy’s for example. In their social media activity, they dare to go bold and use a daring language. In fact, they are known for brutally roasting their audience. But if you study the case closer, it isn’t surprising at all! They know their target audience extremely well, and they have a personality which their audience resonates with. In other words, it allows them to get closer to their audience and ultimately also build a better relationship with them. What brand message do you want to send? Your brand message is partly decided by your target audience, and the personality you have and set. A social style and brand message go hand-in-hand and are basically a map and guide to how you should act on social media. Whenever someone feels insecure about how to manage your social media, they should be able to take a quick glance at your social style guide and know what to do. As a brand, you can create a brand message guide that is independent, or, you can incorporate it into your social media strategy. But since creating a brand message strategy and guide is a completely own article in itself, I’ll refrain myself from writing about it from start to finish in this article. Instead, I’ll leave you with the link to the guide that teaches you How to Create a Coherent Social Media Style and Brand Message. Yes, it is true that you should have a personality as a brand that resonates with your target audience. However. (Here comes the but). Something that is important to think about is sending a brand message that doesn’t come off as inauthentic. What this means is that you stay away from using a personality or language which can come off as “try-hard”. Knowing how to stay away from it is actually simple. When you have to google an abbreviation, a word, or a new “hip” trend that is going on, it’s probably best if you stay away from using it in your marketing in the hopes that it will bring you closer to your audience, because there’s a risk that it will backlash and come off as authentic. In the worst case, you’ll be seen as a fraud. This means that sending a brand message that doesn’t really align with you and your team’s personality and values is certainly not a key to success. your language is an important part of your brand message. And here, you need to think about how you want to portray your brand and products. Let’s say you are going to write a caption for an image of your product. 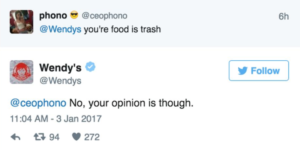 Again, Wendy’s will work as an example, because they have great control over both their target audience and their brand message. 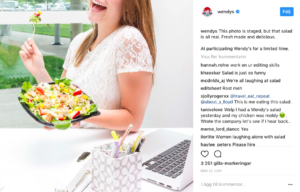 In the caption, they incorporate humor and joke about the image, while also promoting their salads. American Express, however, who is within the space that is known to be conservative, uses a completely different language and brand message: A serious tone. Simply because it’s more appropriate both for the industry and their audience. Your personality should be reflected in every single piece of your brand on social media, and your strategy should help you do so. Your profile bio needs to be fine-tuned to perfection and tell what your brand is all about, your website link needs to be relevant, and let’s not forget, your profile picture should be amazing. Preferably, your profile picture should be your brand’s logo. Your logo should be used across all your social media accounts to help with visibility and getting instantly recognized, and it can also be used to watermark your images to make them more consistent and recognizable (more on that further on). If you don’t yet have a logo, it’s important that you create one. Your logo plays an important role in the personality and message you send as a brand, but it also helps people recognize and relate to you. With LogoJoy, you can create amazing logos in a heartbeat, and the best part is that it’s completely free! Simply type in your brand name, choose logos you like for reference, complete the rest of the steps and then choose a logo they create for you. In other words, what is success to you? If your goal with social media is to increase your newsletter subscribers by 100%, but instead, you increase your sales by 50% and increase your newsletter signups by 2 people. Is that a complete failure or is it a success? That’s why it’s so extremely important to set goals. If this happens, it’s important to evaluate: what made us not reach our initial goals? What made us improve the results of a completely different metric instead? The questions about the content you will distribute is covered by your content strategy, but since your content strategy is a part of the bigger picture that is your social media strategy, I’ll cover it here as well to get you started. Creating a content strategy is a big task. There are tons of questions to ask, and if we’d go through it all here, we’d be here all day. Your content strategy tells you what you should share, how you should share it and when you should share it, shortly summarized. In other words, it’s a map just like your social media strategy that covers it all and tells you what you need to do. On social media, content is vital for success. There’s no going around it. Without content, you won’t generate a lot of results. That’s one thing that I can say for sure. Why? Because of the simple reason that all social media platforms are circulating around content! When starting out, sharing content is tough! I know! And it doesn’t exactly make it better when you read the fact that you should post one to 5 times a day on each platform.Each platform! But thankfully, with a clear content strategy, your job with creating and sharing your content will be much easier. When will you share content? This is a question that is asked all around the web, and the real, and boring answer is that it depends! For some platforms, it’s enough with once a day, and for others, 3 times a day is recommended. 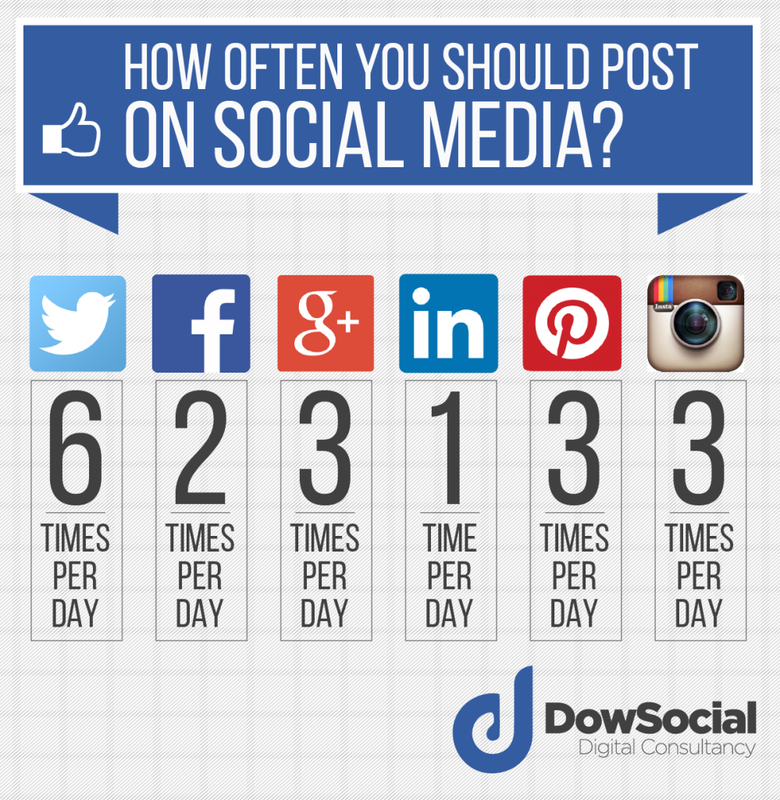 But when starting out, use the minimum of 1 post a day as a guideline. Here are the recommended number of posts according to Dowsocial, but not that most sources say differently, and the best is to experiment and try yourself. Another thing that your strategy should help you with is to tell you what you should share when you are out of ideas. When you are to create content every single day, it’s natural to run out of ideas sometimes. Unless you have a professional content creator. The real answer is that you need to try out and see what the ultimate number of posts is for you because the truth is that it depends on a variety of different factors. Your social media strategy, that also contains your content strategy, should also tell you what type of posts you should share. Just like your captions and text, these should reflect your brand’s values and personality. When sharing visual content, which often is the case on social media, you also want to think about sharing appealing content that is consistent. This means that your content is coherent and holds a particular style that reflects your brand and message. When you have identified the people you are targeting, you want to start listening to the conversations that are circulating around your brand. Partly because you want to get to know them better, and partly because you want to join the conversation, engage with them, and build better relationships. Are the mentions positive or negative? Do they give criticism that can be used? What channels are they talking about you the most? Social listening is essential for brands because of so many reasons, yet most brands ignore it. Some because it is difficult, others because they don’t have a clear strategy telling them how to do it. Thankfully, you are here, and can incorporate this part in your strategy as well! Your strategy should tell you how to find these conversations, and how you’ll meet them. This is also an important part of the much larger customer service on social media. There’s a lot to think about when using social media for customer service, but let’s go through the basics to get your strategy set up properly, and help you get started. 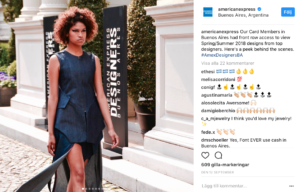 An easy way to find people talking about your brand is through hashtags. Most social platforms have them, and they are super easy to use. When searching hashtags for your social listening, you want to search for the most relevant terms that you can imagine people using for your brand. You also want to search for common misspellings in case someone has misspelled your brand name, and so you don’t miss out on important conversations. On Instagram alone, there are over 5 million posts using the hashtag #CocaCola. And I can promise you that if Instagram would invest resources into listening to all of them, they would get a ton of valuable information and insights. On Twitter, for example, you can search for particular keywords using the custom search feature. This will allow you to find tweets about your brand that isn’t using your hashtag. While social listening isn’t necessarily part of a social media strategy, it is tremendously helpful for developing your strategy and improving it. By listening to your audience, you can learn a lot about how you can improve your brand, your products, your social strategy, and the content you share. Believe it or not, but your audience has a ton of valuable thoughts, and you are missing out on valuable opportunities if you don’t listen to them. Your strategy means nothing unless it is executed on. But executing without a strategy isn’t something you want to do either. By having a strategy, you know exactly what your goals are, and how you should get there. Your strategy will also tell you a lot more than that as well. Before you begin with social m, creating a strategy should be yo ur first action. When you have one, you’ll be able to execute more effectively and reach your goals quicker. NextWhat Are Some Of The Biggest Concerns For Students When Writing An Essay?